Here is the Father and Son quilt all finished, washed and snuggly and used. Daddy and my son snuggled under it to watch the Harry Potter movie on Sunday afternoon. It was a much chillier day, so I didn’t have to ask twice if they wanted me to go and fetch the quilt. Movie, popcorn and cuddling up to Dad what more could a boy ask for. The quilt is made from my son’s shirts which he had outgrown and some old shirts of my husbands. I was inspired by the talented Alicia and her book Stitched in time, where she has a quilt made from children’s old clothes. I love that I have made something special for him because so often I make things for my daughter and he feels left out. Well, no longer. Well folks here it is. I’m afraid my photography skills are pretty limited, and, as they (whoever they are) always say, it really does look better in real life. I have never hand quilted anything before and there were a few injuries on the way. My husband asked it I needed “one of those things you have to stop all the finger pricking”, but I’m afraid no thimble covers the whole hand does it? Any way, I love my little cup cakes and when I can find my mini pegs I will put it on it’s little wire hanger and place it in my sewing room. My son has grown so tall over the past year, shirts that fitted him last summer are now showing far too much tummy! I went shopping before the holiday and bought a stack of new t shirts and he can now be happy he isn’t wearing a cropped top. But what to do with the cotton shirts? I used to give all clothing to charity or hand it on to friends, but now I’m officially a sewer I don’t like to throw things made of 100% cotton away. 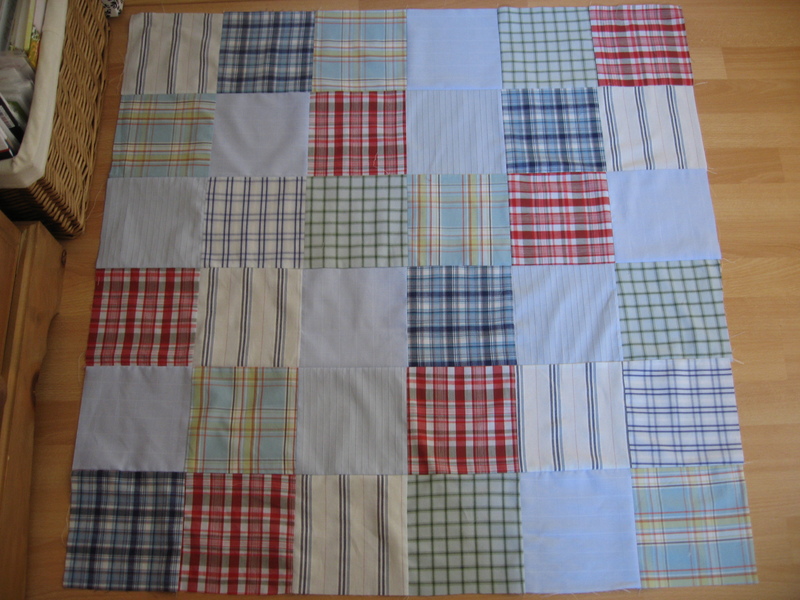 It is currently 36” square and I am going to add a 5″ border in white. I think it should make a nice size lap quilt for my son then. It was a little tricky to sew because some of the shirts are loosely woven, but i did my best to make it square and I thought it wouldn’t really show when it is all quilted and wrinkly. Now off to do the border. It was made by the lovely Amy, she is a very talented lady and she has an etsy shop here. I have done most of the applique work on mine and I am going to do some hand quilting, which is another new thing for me to try so you may not get to see the finished result for a little while. But that’s OK, isn’t it? This is what I was up to in some spare time I found last week. I started this quilt top ages and ages ago. I know, I say that alot, but other projects get in the way. I really love the colours and layout, and I just love the chocolate polka dot bricks, they really jump out at you. Next up is to piece that back, I have alot of scraps that I have started to piece into a long narrow strip, then I will have to see what I have left to do the rest. I plan to do some free motion quilting on this and have been practising. After researching on the web I discovered that the sewing machine should be set to go quite fast and you should move the quilt with your hands at a medium speed. The results have been quite encouraging, now all I have to do is wait until I get some new thread and some quilting gloves to have a go. As you know, I help out with the sewing club at lunchtimes at the school my children attend; the lady who runs it is very talented. A number of us not so talented helpers suggested that she should run classes for adults and guess what? She offered to teach us, for free, at her house about once a month. The second meeting was today but my 4 yr old daughter was up all night (yep from 1-7am being sick so we both spent the morning in bed) so unfortunately I missed it. However I have my homework to show you from the last lesson. We were taught log cabin and 9 and four patch blocks, which we then had to go home and make a 12 inch block incorporating those techniques. I haven’t shown the teacher my effort so don’t judge me too badly if I have got it all wrong, but I am happy with the outcome. 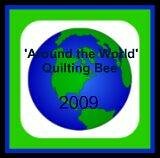 The idea is she will show us how to make a sampler quilt so we get an idea about different quilt designs. I am very excited about it, and am now really looking forward to the next meeting. Although I am yet to finish this, (and that is going to be a wall hanging) I have started making my first proper quilt, based loosely on this. I bought some of Annette Tatum’s House fabric so long ago I felt it was about time I pulled my finger out and got to work on it. Then I started piecing together these. 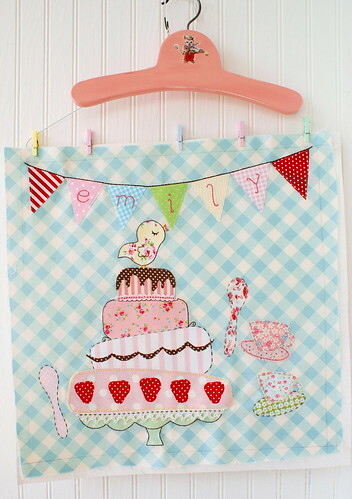 And hopefully it wont be too long before I have one snugly pretty stylish quilt to keep me warm! I will keep you updated.